Yes, Christmas is next week. And though the time has flown by for me too, I won’t bore you with more talk of “OMG!can you believe it! !1!” What it really means is that you’ll be invited to someone’s house, or hosting in your own. There’ll be anything from a five minute “Hello, Goodbye” chat, to a multi-course sit-down dinner (with or without wine pairings), to a several-day stay. And people, you’d better not show up empty-handed. So to help you out, this week is dedicated to gift breads. These are breads to bring to a party as a hostess gift, to pack along in your suitcase as a lovely “thank you”, or to pull out for your sleepover guests for breakfast. 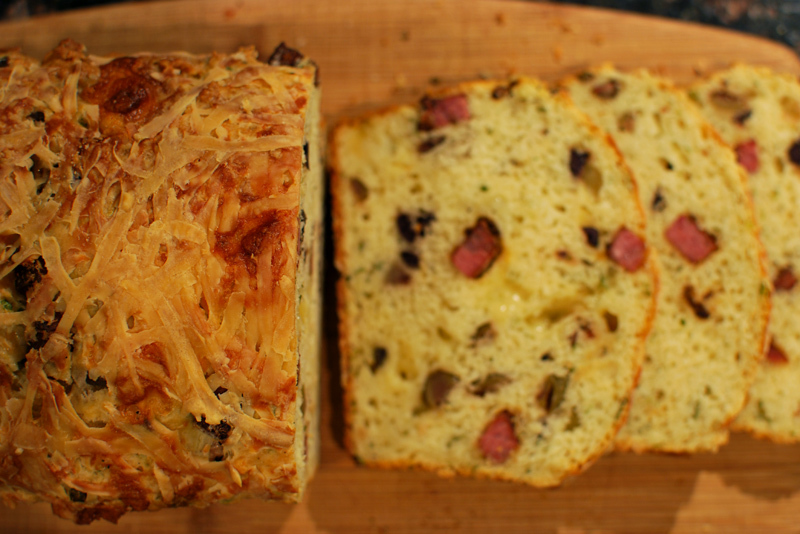 First is a savory quick bread, inspired by the craze for such that is currently sweeping French kitchens. 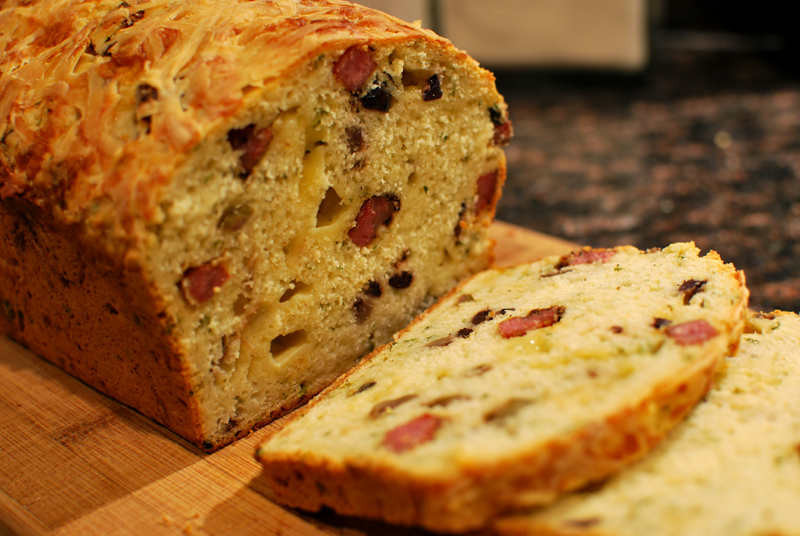 Where you might find chocolate, nuts, or fruit in a typical quick bread, here there is instead cheese, meat, and olives. The effect is quite French and, of course, quite delicious. The plentiful use of cream and milk lends a richness to the crumb, making it worthy of its French name, “le cake”. Moist and tender, it threatens to crumble in your hand, just barely held together by the melted cubes of Havarti cheese, top and bottom crusts crisp with baked Parmesan. Intensely flavorful bits of browned salami compete for attention with salty olives, both of which are made more vibrant with the green brightness of fresh parsley and basil. Though you might not serve this for breakfast, it would be an excellent addition to any brunch menu, or would make a charming snack (in the afternoon or late at night). And certainly, anyone would count themselves lucky to be on the receiving end of this amazing bread. 1. Preheat the oven to 350º F. Lightly butter a 9 x 5 inch loaf pan, and sprinkle with half the Parmesan, reserving the rest. 2. In a medium skillet over medium heat, cook the salami until just beginning to brown. Leave to cool in the pan, and mix in the olives. 3. In a large bowl, whisk together the flour, salt, baking powder, cayenne, salt, and pepper. Add the Havarti, herbs, salami, and olives, tossing to combine. 4. In a small bowl or measuring cup, whisk together the milk, cream, yogurt, egg, and olive oil. Using a nonstick spatula, quickly and gently fold the wet ingredients into the dry, until just combined. The batter should be wet and sticky. 5. Scrape the batter into the prepared pan, and sprinkle the remaining Parmesan on top. Bake at 350º F for about 45 minutes, or until golden brown on top and a skewer comes out clean when inserted into the center (be aware that if it hits some melted cheese, it will come out sticky). 6. Let cool in the pan for 10 to 15 minutes before turning out. Serve warm, or let cool thoroughly on a wire rack before wrapping tightly and freezing. 1. Instead of salami, feel free to use pancetta, bacon, speck, prosciutto, sausage, or whatever you prefer. 2. I used an even mixture of parsley and basil, but whatever fresh herbs you like would be fantastic too.